Live coverage of David Cameron’s conference speech. The Evening Harold brings you the highlights as they happen. 11:58 – “This country will make the right choice”. Is it Xfactor final already? 11:49 – “We must remember the most vulnerable children”. Wasn’t his hero, Mrs Thatcher, a good friend to Jimmy Savile? 11:45 – Gove “is a cross between Mr Chips and the Duracell Bunny”. What?. Fashionable in the 80s? 11:37 – “your home is your castle. Well for many of my family and friends that is true”. 11:33 – Anyone else get nervous hearing a Tory say “here’s the thing about this race”? 11:28 – “It doesn’t matter whether you are black or white, or what school you went to, if it wasn’t Eton you can’t get in my cabnit”. 11:24 – “Thatcher was the best peacetime PM we have ever had”. Osborne’s off again. 11:23 – Did he just say Thatcher won the Cold War or Coal War? 11:18 – “we may be a small Island”. George Bush is now regretting not invading. 11:16 – “We have not lost respect” in Europe. Nope, it is lost all over the world. 10:55 – Looking around at the delegates it looks like some of them may be coming to there final conference. It is fun to see the relief of people’s faces when when a nudge wakes the person next to them. 10:53 – A lesson in proof reading. The line “for hardworking people” can be seen around the hall. This was a printing error, it should have been “for working people hard”. 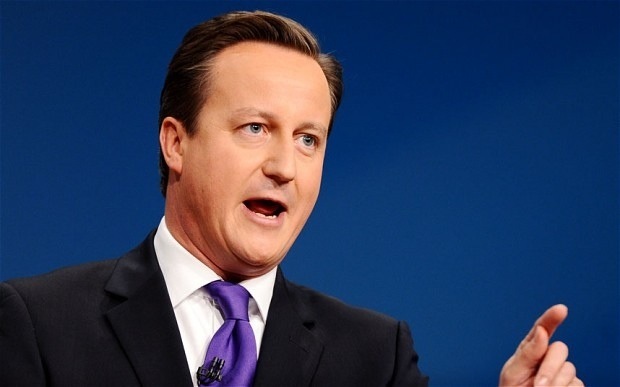 10:43 – David Cameron’s speech is always a technical nightmare for venues. It takes an amazing lighting director to avoid the ‘forehead shine’ dazzling the audience.